Abstract: The Sjenica plagiogranite occurs in the southern part of the Dinaridic Ophiolite Belt, 5 km northwest of Sjenica. The main minerals are albite with strongly altered biotite (replaced with chlorite), with occasional amphibole (magnesio hornblende to tschermakite) and quartz. An enclave of fine-grained granitic rocks with garnet grains was noted too. Secondary minerals are calcite and chlorite (daphnite). Major, trace and REE geochemistry coupled with field observations support a model by which the Sjenica plagiogranite could be formed by fractional crystallization of mantle origin mafic magma in a supra-subduction zone setting. Occurrences of calcite and chlorite nests in the Sjenica plagiogranites revealed that these rocks underwent hydrothermal alteration due to intensive sea water circulation in a sub-sea-floor environment. Abstract: The Ophiomorpha rudis ichnosubfacies of the Nereites ichnofacies was recognized in thick- and very thick-bedded sandstones of the Lower Istebna Beds (Campanian–Maastrichtian), which were deposited mainly in deep-sea clastic ramps and aprons. It contains mainly Ophiomorpha rudis (produced by deeply burrowing decapod crustaceans) and rarely Zoophycos isp. and Chondrites isp. The impoverished Paleodictyon ichnosubfacies of the Nereites ichnofacies is present in the medium- and thin-bedded packages of flysch sandwiched between the thick- and very thick-bedded sandstones. They contain Chondrites isp., Phycosiphon incertum, Planolites isp., Arthrophycus strictus, Thalassinoides isp., Ophiomorpha annulata, O. rudis, Scolicia strozzii and Helminthorhaphe flexuosa. The relatively low diversity of this assemblage is influenced by limited areas covered by muddy substrate, which favours deep-sea tracemakers, and partly by a lowered oxygenation in the sediment. 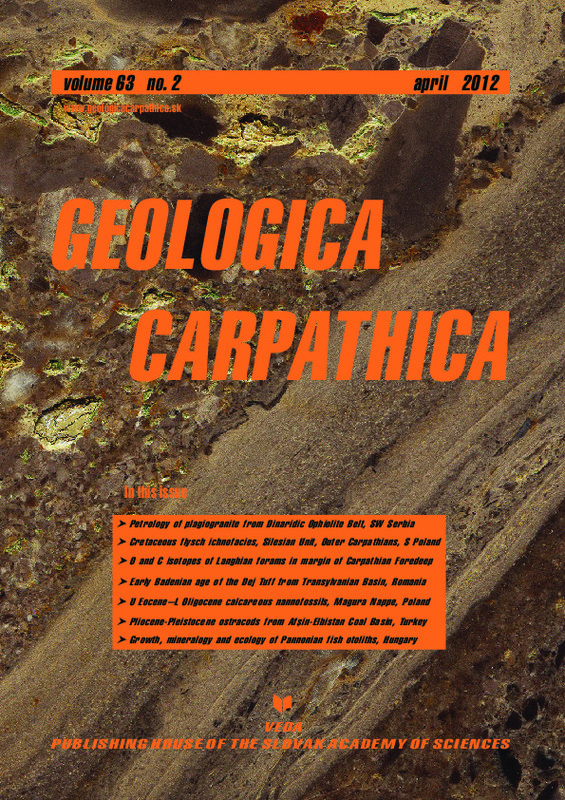 Abstract: Foraminiferal assemblages from three locations of the Moravian part of the Carpathian Foredeep (Kralice, Premyslovice, Zidlochovice) have been studied in order to determine the paleoenvironmental conditions during the Early Badenian (Middle Miocene). Paleobiological characteristics (plankton/benthos-ratio, relative abundances of warm-water plankton species, five-chambered Globoturborotalita spp., Coccolithus pelagicus and high nutrient markers [benthos], test sizes and ranges of Globigerina sp. and cibicidoids, Benthic Foraminiferal Oxygen Index) were determined along with stable C and O isotope compositions. The stable isotope compositions show large variabilities indicating sample inhomogeneity in well preserved foraminiferal samples, interpreted as a sign of primary environmental variation and postmortem mixing of tests of different populations and sources. Based on the combined interpretation of paleobiological indicators and isotopic compositions, two theoretical models were established to describe the observed paleobiological and stable isotope data, that were used to categorize the locations studied. Several types of near-shore paleoenvironment were distinguished using the theoretical models: (i) bay influenced by seasonal phytodetritus supply from the continent (Kralice); (ii) dynamic shore characterized by variable isotopic compositions probably due to mixing of indigenous, transported and reworked tests (Premyslovice); (iii) shore of alternating normal marine and continentally influenced environments (Zidlochovice). Abstract: The Dej Tuff is an important stratigraphic marker in the Transylvanian Basin. However, its Early Badenian age is known only on biostratigraphical grounds so far. A number of radiometric dating techniques including K-Ar, Ar-Ar and fission-track have been used in order to constrain more precisely its age, allowing the calibration of the Transylvanian Basin’s evolutionary models. Although individual dating methods could not provide a unique, reliable and accurate radiometric age, comparison and evaluation of multiple methods gives 14.8–15.1 Ma as the most likely formation age of the Dej Tuff. Abstract: During the period of ca. 20 Ma (Middle Eocene–Chattian) the Leluchów Succession of the Magura Basin passed through drastic changes of sedimentary condition and paleobathymetry from well oxygened red shales with Reticulofragmium amplectens, deposited beneath CCD, red Globigerina oozes, to oxygen depleted organic-rich menilite-type shales and finally to flysch deposition of open marine conditions. The biostratigraphic and lithostratigraphic scheme is well established with the Leluchów Marl Member — Zones NP19–20 to NP22 (Late Eocene–Early Oligocene), Smereczek Shale Member, Zone NP23 (Early Oligocene) and the Malcov Formation s.s., Zone NP24 (Early–Late Oligocene). The aim of the paper is to present the quantitative analyses as the basis for paleoecological changes in the Magura Basin during the Late Eocene–Late Oligocene period. The changes manifest themselves through a decrease in the water temperature and progressing eutrophication. Species typical of brackish water conditions and restricted to the Paratethys region were identified from the NP23 Zone. Abstract: The Afsin-Elbistan Coal Basin, which is one of the largest and most important Pliocene-Pleistocene lignite basins of Turkey, is located in Eastern Anatolia. The basin was formed between two normal faults having NE–SW direction and these faults controlled both the sedimentation and the subsidence. The coal horizon of over 50 meters in thickness indicates the balance between the sedimentation and subsidence rates, and was preserved during peat deposition. Coals were generated in this extensive and shallow freshwater lake and evolved from the Pliocene to Pleistocene. Typical faunal and floral assemblages of this ancient Afsin-Elbistan freshwater lake are Ostracoda, Mollusca (Gastropoda and Pelecypoda), spore-pollen and Characeae (gyrogonites). Eleven Cypridoidea species were identified from the investigation area. Eight of them are already known (Candona neglecta Sars, Candona iliensis Mandelstam, Candona aff. candida (Müller), Pseudocandona compressa (Koch), Cyclocypris ovum (Jurine), Ilyocypris gibba (Ramdohr), Cypris pubera Müller, Heterocypris salina (Brady)), whereas three belong to open nomenclature — Candona sp. and Eucypris sp. ; Dolerocypris anatolia nov. sp. is proposed as a new species. Dolerocypris Kaufmann is one of the largest genera among the freshwater Ostracoda. It has a very wide geographical distribution. Representatives of this genus are actively swimming species found in shallow zones of freshwater lakes and reported from small grassy water bodies with megascopic plants. Dolerocypris anatolia nov. sp. is recorded from core samples of the Pliocene-Pleistocene Afsin-Elbistan Coal Basin for the first time. Abstract: Ontogenetic age and body dimensions were studied on three extremely well-preserved sciaenid fish otoliths from sublittoral marls of Lake Pannon from Doba, Bakony Mts, Hungary. Macroscopic and microscopic observations offered clear evidence for the preservation of the genuine structural characteristics, for instance the bipartite incremental features. Ontogenetic ages were assigned for the three specimens as 16, 7 and 6 years by counting the annuli of the sagittae. Analytical results prove that the original aragonitic mineralogy has been preserved making them, and probably other Late Miocene teleost fossils, suitable for future microchemical analysis to reconstruct the past physicochemical environment.